Hello again to our dear family and friends! 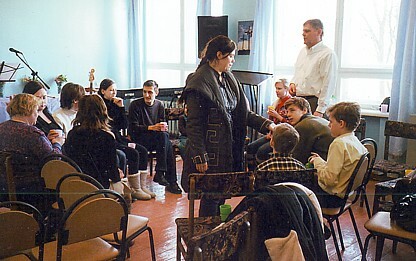 The church here in Tambov continues on with many ministries and meeting times throughout the week. There’s the regular worship service and Bible studies on Sunday morning and Wednesday evening. There’s also the weekly evangelistic English class, as well as a weekly evangelistic guitar class. We are always teaching and praying for people that, by the Holy Spirit, spiritual blindness and the distraction of material things will be overcome. The Holy Spirit has done much here over the years and He continues to do so. It’s been truly miraculous and a joy to see. Much more always needs to be done. I have been praying for a long time about how to do service to the poor or sick here in the name of Jesus. Well, there is an elderly couple that live above us in our 9 story apartment building. 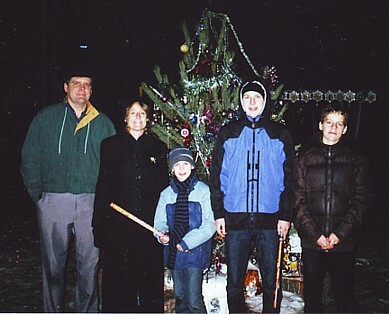 During the summer, the woman, Tatiana, became sick and was at the hospital across from the courtyard of our building. I was able to visit her and read to her some of the Bible. Later, she returned home to her apartment. I had always offered to bring some of my home-cooked food for these people, but they had politely refused. I knew they lived on a meager diet. Well, anyway, the man, whose name is Volodia, had a stroke and had to stay in a hospital for a while. When he came home, he could no longer go out and shop for groceries. So Ray and I now shop for all their groceries everyday and bring them to them… and I sometimes cook for them. Sometimes I read a little from the Bible and play the guitar and sing for them. They like the songs. Music has a special way of getting past the guards in people’s hearts and letting in the Gospel. God is helping us in practical ways with another of our neighbors across the hall from us. My youngest 10 year old son, Bobby, is in third grade at the Russian school. He transferred to a new school with a third grade teacher that is almost a grade ahead of his old teacher. It was very difficult for Bobby at first to reach these high standards. His new teacher expected his Russian grammar homework to be turned in already checked by the parents and copied perfectly into his homework notebook. Even Bobby’s older brothers 14 and 16 years old could not guarantee perfect endings on every Russian word and perfect grammar, so our neighbor Valia is helping check Bobby’s work before he copies it in pen into his homework notebook. We have also been getting Valia’s groceries for her and now she is delighted to do something for us. 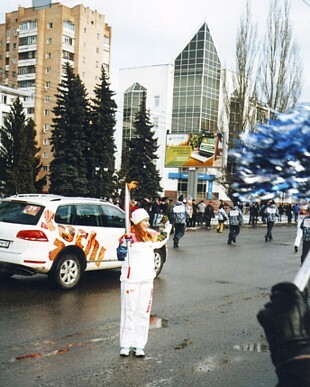 Besides, she loves Russian grammar and proudly says that she did well in that subject while she was in school. Thank you for sharing this brief moment of time with us. Thank you for all you do for us. Please remember us in your prayers. We love you.